Gig Gear, maker of Gig Gloves—protective work gloves designed specifically for live event and entertainment production professionals—has been selected to the InfoComm 2018 Innovations Showcase, which highlights new tech companies and products for the commercial AV market. While not a technology-based enterprise like most companies traditionally selected to the showcase, Gig Gear’s Gig Gloves are designed to provide an invaluable service to the professionals who work within the AV industry: helping them complete their jobs more safely and effectively. “Gig Gear is very excited to have been one of the few companies selected to participate as an exhibitor at the 2018 InfoComm Innovations Showcase,” said Danny Shatzkes, founder of Gig Gear. “We’re aware that the Innovations Showcase has been very selective and includes mostly tech companies showing their cutting-edge technology products and services. However, behind all of the technology in pro and commercial AV, installation and integration, there are actual human beings that need to do the physical work required to get these systems working flawlessly. 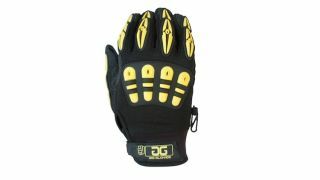 Featuring strong nylon threading throughout, Gig Gloves include TPR molding on the back of the hand and fingers to ensure ultimate protection against impact, abrasions, or pinching. Fold-over fingertips allow for use of smaller tools and items, and Gig Gloves work with touchscreen devices without needing to be removed. They are available in three models—Original Gig Gloves, all-black Gig Gloves ONYX, and fleece-lined THERMO Gig Gloves—and come in six sizes (XS-XXL).